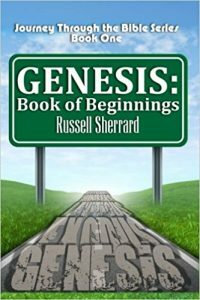 My book “Genesis: Book of Beginnings” is FREE for 5 Days Monday, September 3 to Friday, September 7. This book is a Bible Study of the Book of Genesis in the Holy Bible. The Bible text used for this study is the King James Version (KJV). This Book is the first book in the Series entitled Journey Through the Bible. Genesis: Book of Beginnings Book 1. This book is a Study Guide for the Book of Genesis in the Holy Bible. The Bible text used for the study is the King James Version (KJV). It is fitting that we should start with Genesis, which is the book of Beginnings. Genesis: The Book of Beginnings is the first book in this series of Journey Through the Bible. Genesis means “the beginning” and it is a book of beginnings. It records the creation of the world and the beginning of the nation of Israel. Chapters 12-50 focus on one man, Abraham, and his descendants. Abraham, his son Isaac and his grandson Jacob are called the patriarchs of Israel. Jacob’s twelve sons are the beginnings of the twelve tribes of Israel. Through Joseph, one of Jacob’s sons, the whole family settles in Egypt. The word Genesis means origin or creation. Genesis, the first book of the Old Testament, is a book of beginnings. It has been said that every major doctrine has its seed or beginning in Genesis. For example, the material universe, the human race, sin, the promise of the Messiah, languages and the Hebrew nation all have their beginnings in the book of Genesis. For this reason Genesis is called the seed pot of the whole Bible. Every great fact, truth and revelation is found in this book in germ form. The book of Genesis is essential to the understanding of all the other books of the Bible. Moses wrote the book of Genesis about 1500 years before Christ. Moses received the oracles directly from God. They were not handed down by word-of-mouth (Acts 7: 37, 38). God can just as easily tell a person the past as he can the future. The book Genesis covers a time period of nearly 2500 years, from the Creation to the journey of Israel into Egypt. After reading the book would you do me the honor to pop over to Amazon and give an honest review? The Jews knew the Law, the Old Testament, and understood the Messiah. This introduction to the first gospel ever written, just a few years after the resurrection of the Messiah, was either a declaration of the power of God or absolute blasphemy. To the Jewish audience and non-Jews who understood Judaism, this was the clearest possible declaration that Jesus had the legal authority to be the Messiah. Written after Matthew, probably before Mark, and decades before John, Luke was the only gospel writer who did not personally witness the life of Jesus on earth. Luke’s gospel is based on careful investigation of eyewitnesses. This provides us a different point of view, probably a Greek point of view. Because of his Greek name, many also assume that Luke was not a Jew. Since many people attempted to write about the Messiah, we know that the Spirit of God did not see fit for most of these attempts to survive. Mark is the gospel to the Romans, written decades after Matthew and Luke were well known. It was intended to communicate as much information as possible to very busy people who, at least on the first read, would not spend much time with yet another religious book. However, Romans were used to multitasking and assimilating written material. Under Solomon, Israel controlled the eastern Mediterranean and sent trading ships far beyond any boundaries the Romans knew. They defeated a million-man army out of Egypt and Africa. Israel still existed as a nation, unlike Assyria, Persia, the Hittites, the Babylonians, and the other kingdoms of the Middle East. Jews friendly to Rome lived throughout the Roman Empire, including in Rome. The Jewish temple of Herod was larger, covered in gold and the most magnificent building in the entire Roman Empire. The thick, tall walls combined with the water supply of the pools of Bethesda made Jerusalem more defensible than any city in the Roman Empire, including Rome. Jerusalem was also rebellious and difficult to govern. For these and many other reasons, the average Roman was very much of aware of the Jews and their prophets, even if they did not know Isaiah by name. The Romans also believed in a recent creation by God, or gods, as described in Ovid’s Metamorphoses. The Romans believed in just laws and just administration of those laws. Though Roman beliefs were very different from taught by Moses and in the Torah, Mark believed that he could omit Creation and the Law from his gospel and go immediately to Jesus the Messiah based on the prophets and the testimony of John the Baptist. Decades later the gospels of Matthew, Mark, and Luke were known throughout the Roman Empire and available to anyone who was interested. John wrote the final gospel to the philosophical Greeks to combat Gnosticism. He took a very different approach, beginning with Creation and Jesus as the Creator. In the beginning was the Word. And the Word was with God. And God was the Word. All things were made by Him and without Him was not anything made which was made. John 1:1,2. Creation is where God’s revelation to the Jews begins. The entire universe came into existence by God speaking it into existence. God did not wave a wand, cast a spell, or use intermediates such as angels. God did not think the universe into existence. God spoke it into existence. Without creation, there is no gospel. All Scriptures are from the International Standard Version. Whether you eat or drink, or whatever you do, do everything for the glory of God. Every believer I know agrees that every thought and action should glorify God; many with a shrug. because it should go without saying. But many who call themselves believers simply are not living this way. Who are you to tell me that doing what I enjoy is evil? Aldous Huxley called his Brave New World, “The nightmare of total organization …” As one of the most widely read books written in the 20th century, many people, like myself, read it as an English requirement without spending much time thinking about it. When Aldous Huxley contrasted his fantasy world with Orwell’s 1984, he believed that his fantasy world, Brave New World, was more likely to become reality. Both 1984 and Brave New World are fantasies of total government control. Only the methods are different. The question Aldous Huxley raised is “Which method is more effective: fear of punishment or desire for acceptance and reward?” “In the light of what we have recently learned about animal behavior in general, and human behavior in particular, it has become clear that control through the punishment of undesirable behavior is less effective, in the long run, than control through the reinforcement of desirable behavior by rewards, and that government through terror works on the whole less well than government through the non-violent manipulation of the environment and of the thoughts and feelings of individual men, women and children. This view, expressed by World Controller Mustoapha Mond, is very similar to the written goals of Secular Humanism. They believe it to be a good goal. Plato’s Republic uses very similar, though not identical, goals for his ideal government. It is similar to the stated goals of the French Revolution, Karl Marx, and even Fascism. All of these found that the reinforcement of desirable behavior through rewards failed to control enough people and turned to force as in the 1984 fantasy. These governments believed in control first and foremost. While reinforcement of desirable behavior was preferred, control was essential and whatever methods were necessary were used. This was historic reality. Aldous Huxley believed that the tools to manipulate desirable behavior would be improved and become more pervasive. However, even in the total fantasy of fiction, Mustapha Mond had to lie, perhaps even deceiving himself to make his case. The phrase (sentence actually), “they’re not afraid of death” is a lie. It might be that citizens of the Brave New World are too busy and too conditioned to face or even think about death. But the death of John’s mother Linda shows death when they actually faced it. She returned to civilization after living for decades on an Indian Reservation in New Mexico. “At forty-four, Linda seemed, by contrast, a monster of flaccid and distorted senility.” p 223 She choose to escape reality and live entirely in a drug (soma) induced wonderland until her death shortly after her return.””Every one belongs to every …” Her voice suddenly died into an almost inaudible breathless croaking. Her mouth fell open: she made a desperate effort to fill her lungs with air. But it was as though she had forgotten how to breathe. She tried to cry out-but no sound came; only the terror of her staring eyes revealed what she was suffering. Her hands went to her throat, then clawed at the air–the air she could no longer breathe, the air that, for her, had ceased to exist. They were conditioned to believe that death ended everything. Eat, drink and be merry, for tomorrow we die. The individual existed solely to support the community. Solitude and independent thinking were heretical. It was a society with no moral purpose or even reason for existing. Any attempt to obey any form of tradition outside of society’s conditioning was wrong and produced a guilty conscience. Huxley uses the third person omnipotent point of view to explain this. “In the taxicopter he [John] hardly even looked at her [Lenina]. Bound by strong vows that had never been pronounced, obedient to laws that had long since ceased to run, [marriage and chastity] he sat averted and in silence. Sometimes, as though a finger had plucked at some taut, almost breaking string, his whole body would shake with a sudden nervous start.” p. 186Mustapha Mond shows that this moral vacuum is the result of rigidly enforced choices. “”A pity, he thought, as he signed his name. It was a masterly piece of work. But once you began admitting explanations in terms of purpose-well, you didn’t know what the result might be. It was the sort of idea that might easily decondition the more unsettled minds among the higher casts-make them lose their faith in happiness as the Sovereign Good and take to believing, instead, that the goal was somewhere beyond, somewhere outside the present human sphere, that the purpose of life was not the maintenance of well-being, but some intensification and refining of consciousness, some enlargement of of knowledge. Which was, the Controller reflected, quite possibly true. But not, in the present circumstance, admissible. For those who deny God and claim that His purposes cannot be known, the warnings of Brave New World are the best they can do. They understand the results of certain forms of evil. They understand that this vision of the future is a nightmare. But without God, their solutions are only other nightmares of various forms. Without God, there are many other possible nightmare scenarios besides a totalitarian 1984 verses a manipulative Brave New World. Sounds like Jerusalem and Judah had it pretty good, right? Look over that list of material provision (support system, food, water) and leadership (military, judiciary, teachers, advisers, craftsmen, and someone who may have been a charismatic speaker or influencer). The use of the phrase skillful enchanter gives us a hint that they weren’t sourcing any of their things or their leaders from the right place. We worship a culture of youth and have for a long time, and here God gives people what they want, youngsters in charge, with disastrous results. People begin to take advantage of each other and the honorable suffer at the hands of these childish rulers. One guy with an intact coat will be grabbed and thrust into leadership, if anybody can make him do it. Apparently nobody will have much more than a coat in those days. Certainly not a will to give proper leadership. Verses 8 and 9 make it clear that the people oppose God and flaunt their rebellion. When disaster comes, they can’t pretend it wasn’t their own fault. Public sins have public consequences. Time to reassure the righteous in verse 10. No matter how bad things seem to get, it will go well with them. And in verse 11 another reassurance we often need when, as the Scriptures say in other places, this question hangs in the air: “Why do the wicked prosper?” God says things will turn bad for the wicked. “Let the punishment fit the crime,” Gilbert and Sullivan’s Mikado says. God says the wicked will get what they deserve. Once again God restates in verse 12 that His people are oppressed because they wanted unsuitable rulers – immature, inexperienced, leading the people down twisting paths. God will judge these rulers. Make no mistake. I’m pretty sure those crushing and grinding references refer at least in part to taxes. People tend to think that government takes care of the poor with welfare and social services. But it doesn’t work that way when corruption takes hold. God is outraged at the twisted mentality that steals from people who already have too little. Verses 16-24 detail a culture that should be very recognizable to us today. Is it a sin to want to be beautiful and have pretty things? Look at the words used: proud, seductive. Women can bring down a whole culture by worshiping self, sexuality, beauty. Dressing little girls in revealing outfits is starting them down the road to sensuality without reserve. Females scream about their rights and their freedoms Modesty has become kind of an obsolete term but God hates that mentality. God will send scabs into that beautiful hair. He will make it fall out, or pluck it out. All that long list of pretty things will disappear and be replaced by stench, coarseness, and disfigurement. The men they have gotten themselves dressed up for will be dying in battle, trying to save their women, but failing. All that emphasis on self, on attracting attention, will change to mourning and loneliness. 1. What clues indicate that God’s people were prosperous but not by depending on Him? 2. Briefly explain what kinds of oppression take place when the wrong kind of rulers get into power. 3. What are some proofs that these people deserve what they get when destruction overtakes them? 4. Give examples in modern culture of women lacking understanding of modesty. 5. Do you think women have in some cases made it more difficult for men to protect them? Explain your answer. Can you see any way in which Isaiah 3 resembles Leviticus? God spelled out laws, described beautiful garments, and even gave proper age ranges for his different kinds of servants. The story of Nadab and Abihu might help provide an example that parallels how people sometimes respond to God’s expectations. There are rewards and punishments in Leviticus. Step into the microcosm and share your observations on how we should really be seeking God’s blessing or avoiding His wrath. What are “the last days?” According to many Bible teachers, they are the time when the Lord has returned to govern the earth. Some people think they want to go to Heaven and be with God forever. Some think we never actually go there, but will live forever on earth. The beginning of this chapter seems to indicate that God will establish a place of worship on earth, in the New Jerusalem. Whatever and wherever this place is, I want to be there. What would it be like to just have everyone want to go to God’s house and learn God’s ways? Right now we do everything we can to wriggle out of it. Commentator Matt Walsh said we are insane in America, trying to find reasons why going to church isn’t really a thing anymore when people in other parts of the world are dying to be able to go to church. Verse 6 says God abandoned His people? What? No! God never does that, does He? Well, if He did, why would He do it? Verses 6-9 explain that there seems to have been so much stuff in the land that there wasn’t any room for God. There are those influences of the east again, like we brought up in the last chapter. Mystical things and just plain things have crowded God out. Every class of people found itself devolving, losing touch with spiritual reality, forcing God out. And so, He went, because He wasn’t wanted. He’s coming back, though, whenever “in that day” is, to humble mankind out of those feeling that they are on top of the world. Hide under the dust and rocks, people. Only the Lord should be on top of the world. This day of reckoning is when God says, “No more. No more idols, no more stuff, everybody down on the ground. Hide if you can …” but you can’t. Terror and splendor don’t usually go together. But they look good on God. At least, they would, if we could look at Him. People will be too busy trying to survive, to hide, to toss away those objects of worship. Did Adam and Eve eat that whole fruit they took and shared? Or did they toss it, dig a hole and bury it, try in some way to hide it? Some people hunt for buried treasure. Looking at the passage where it describes the mountains of riches these people accumulated, and their idols of silver and gold, I wonder how much buried treasure there will be when the Lord rises to make the earth tremble. (v. 19) No one will go hunt for it though. The key to what people are really putting ahead of God is in verse 22. “Stop regarding man, whose breath of life is in his nostrils; For why should he be esteemed?” People don’t really worship those false gods or those things. They worship themselves. Until they accept God’s humbling, they will never understand how terror and splendor can bring salvation. Briefly comment on what you think “the last days” means. Use two or three Scriptures as support. What are reasons people give to justify not going to church? Are there any legitimate ones? Why would God abandon His people? What is man really worshiping instead of God? What is necessary for that to stop? Does Isaiah 2 in any way echo the message of the Book of Exodus? Does it show people insisting that they want to follow God? Any incidences of people seeing God’s clear provision and commands but shoving off in the other direction? Please share your thoughts on these parallels you find on your trip into the Isaiah Microcosm. This is part 2 in an occasional series for a future book I am calling “The Isaiah Microcosm” Please let me know your thoughts on these posts, and how you would answer the questions at the end.